It’s been just over a fortnight since the CTS Dorset marathon and its brutal hills. My calves and quads were sore for days, even with a visit to the physiotherapist, regular massage, stretching and plenty of walking. It wasn’t until four days after Dorset that I was able to go for a short, slow jog; I could barely walk downstairs but running on the flat was OK. This is the first time I’ve contemplated “back-to-back” events, or to be more precise, two marathons in two weeks (15 days). My training plan had me taking a couple of days off after Dorset, then doing a long run in the middle of the first week and then tapering to Portsmouth; ongoing soreness prevented this. 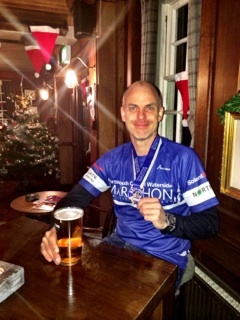 (Some people think they suffer DOMS, or Delayed Onset Muscle Soreness, but my soreness was instantaneous after finishing in Lulworth Cove, there was no delay!) The reality was I could only manage a shakeout run (7km) on the day I was supposed to be running 30km. A couple of days after Dorset, I developed a cough from a minor chest infection. I had flashback nightmares of my flu earlier in the year, but fortunately, this time it was much less severe and mostly dissipated by Portsmouth. In the week before, I did a parkrun, a three 10+km slow runs (two wearing the HRM and with alerts set for the top end of zone 2; it’s been a long while since I’d done this and it seems I’ve forgotten how to slow down enough to keep my heart rate in the right zone) and a final slow parkrun as a stretch (it also happened to be #100). This event is to raise money for the Royal National Lifeboat Institution (RNLI). A worthy cause. Tracy and I arrived in Portsmouth on Saturday afternoon. We checked into our hotel and then went for a wander into town to find some lunch and do a spot of last minute shopping. Afterwards, we went for a walk down to The Pyramids (leisure centre) and the coast line where the marathon would be run. It was cold and the wind chill made it even worse. I said to Tracy, “If it’s like this tomorrow, then I’m going to be in trouble.” Little did I know what was in store for me tomorrow. After a very comfortable nights sleep, I awoke early and started my routine, showering, taping my feet, porridge and coffee. Our hotel was only a very short walk from the starting area, so we were in no rush to step outside the hotel door. We checked the weather on the internet; it was still a few hours before sunrise, but it looked calm enough outside. Eventually, it was time to leave the warm. We stepped outside; although the wind wasn’t as cold as the previous evening, the wind just blew straight through you. We made the short walk to The Pyramids centre and went inside to register. We arrived just in the nick of time to beat the crowds. I grabbed my bib and timing chip and we settled into a spot on the floor amongst the throng of other runners. I was started to consider my layering for the day; some people (obviously locals) were wearing shorts and singlets, I had on considerably more layers and was thinking about adding more! 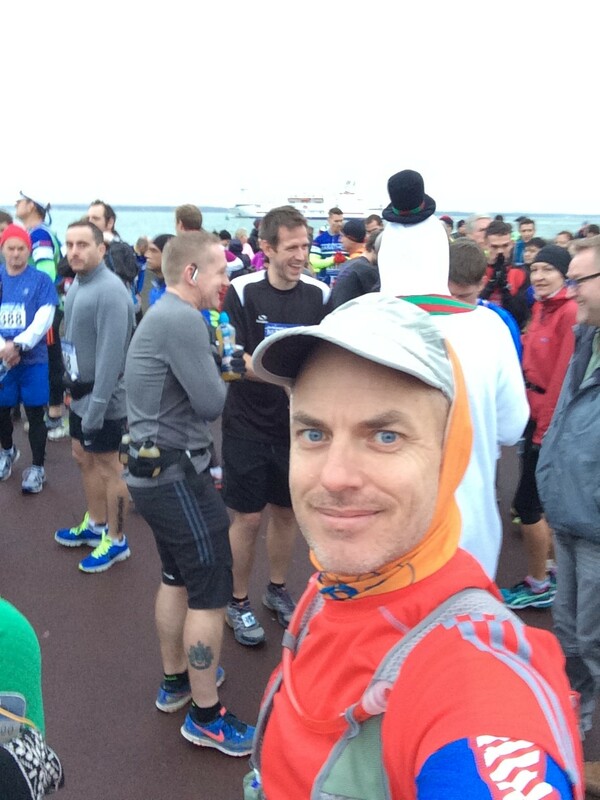 The course was a U-shaped affair, running out and back around the Portsmouth waterfront. The organisers had posted a video of the course on their website, which was to aid the road/trail shoe decision making process and simultaneously causing motion sickness! 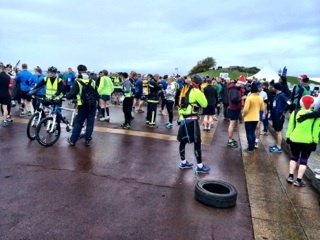 The course was predominately flat, run on some tarmac, trails and cycleways. When the video was made, the weather was dry but (unknown to me) it had been raining for a few days; my decision to wear road shoes may not have been the best. There were some announcements made inside the registration area that once you had completed registration, you could head outside into a marquee near the finish line, so Tracy and I headed out into the cold again. It was only marginally warmer in the marquee than in the open. 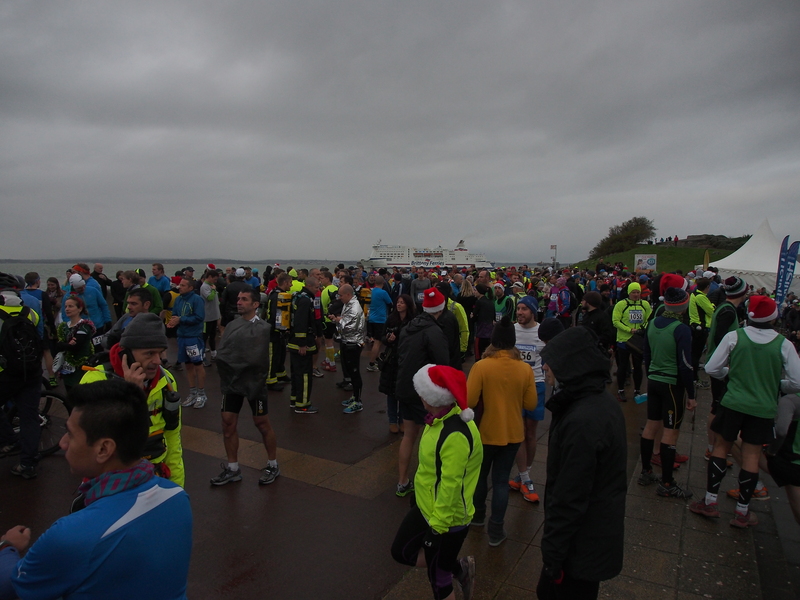 We chatted with a few other runners, mainly about the weather. We learned this event had a reputation for being “tough” when the wind was blowing (like it was today); I was more worried about the wind chill. I decided on three layers on the upper, two on the lower, gloves, cap and buff; others were still in their singlets and shorts! The start seemed a little disorganised; we were herded the 400m or so to the start line, but by the time we arrived, the people who were leading the walk were already off! There didn’t appear to be a starting signal per se, as soon as you trod on the timing mats your event started. This meant there wasn’t a lot of self-seeding based on predicted race speed, so many costumed runners and fun-runners were near the front and many faster runners were further back in the field. The runners headed down the seaside esplanade, people trying to sort themselves out to find their right position in the field, it was a little messed up in places. There were some people doing some inspirational stuff: one guy was running towing a tyre as he was training for some 300mile sled-pulling race across a desert somewhere; three firemen were running in full fire-fighting attire, including their emergency breathing equipment. 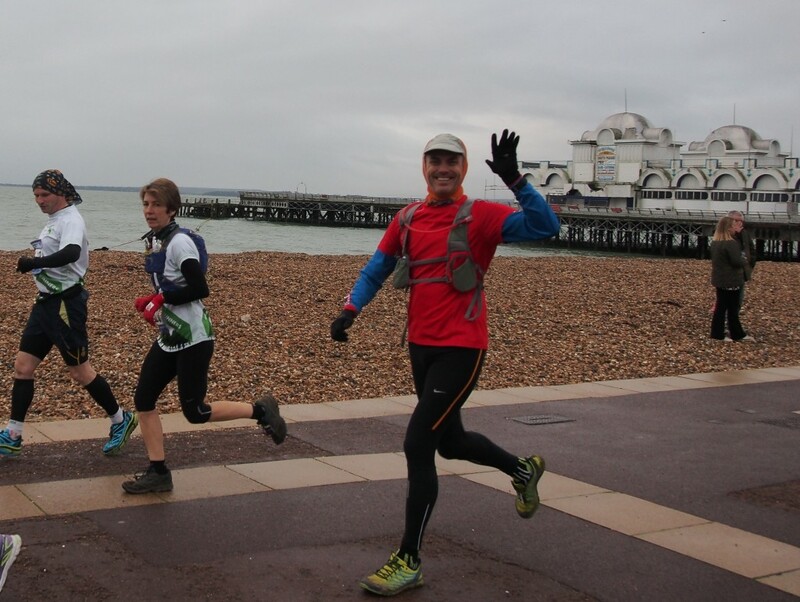 At the start, I was full of inspiration from those at home who had completed their Six Inch Trail Marathon adventure; I felt pretty good considering the pounding my legs took at Dorset, so I thought 3h45m would be a good target to aim for so wanted to maintain 5:20/km. The shambolic start, the queuing at various locations, the large amounts of single track with limited passing opportunities and a couple of minor injuries didn’t facilitate constant pace. Cest la vie. The cold wasn’t helping either. I didn’t have any pace alerts set but that eventually turned out to be a blessing in disguise. During the first 8km or so, the wind was at our backs. This gave you a false sense of pace, but it wasn’t any warmer. After 11km I was warm enough to take my gloves off and a little while later pulled my buff down around my neck. As we rounded the head of the bay, the wind became a nasty cross-wind and then a headwind as made out way along the other side of the bay from the starting area towards the turning point and halfway mark. At one point, we crossed a bridge and the wind just ahead of your right shoulder and fierce. On the way to the turn around, I reckon I put my gloves on and took them off a dozen times; my buff went over my head and down to my neck plenty of times too! Even when I thought I was “warm enough” to remove my gloves and buff, I was still very cold. We kept heading out towards the turn; the track was changing all the time, mud, puddles, pavement, grass etc. All the way, there were pockets of supporters and on-lookers, cheering, offering support and lollies. As I was passing through 10miles (16km) the lead runners passed me on their way back; they were six miles (10km) ahead of me and flying (and only wearing singlets and shorts, but gloves because it was cold!) I made it to the 20.5km turn point and looked at my watch reading 1:48:44 for the first half, average pace 5:18/km. I was on pace, but not feeling particularly good; my feet were sore and I was still cold. After the turn, the wind was behind again and I took my gloves of and pulled my buff down again. I was making pretty good progress towards the head of the bay again, but eventually something had to give. At about 26km we had to pass though a narrow gate, after this I just couldn’t get going again! The cross-wind was chilly and it was just about to become a headwind again. I asked a runner coming passed me if I was still moving; I could feel pain in each foot so I assumed my feet were still moving, but I felt like I was jogging on the spot. He said I was still moving, but I wasn’t sure I believed him as I watched him disappear into the distance. I was still dodging puddles and trying to keep my feet dry (drier). I was still running at 34km when I stepped up from a muddy section of path onto a small concrete wall adjacent the path. The effort caused my first cramp in my hamstring. This was the real start of my slowing, eventually, I was on a run/walk. We were still heading into the wind and I was still cold. My feet were completely numb, which may have been beneficial as I couldn’t feel my sore toe or ankle. With about 10km or so to go, I was lagging behind on pace. 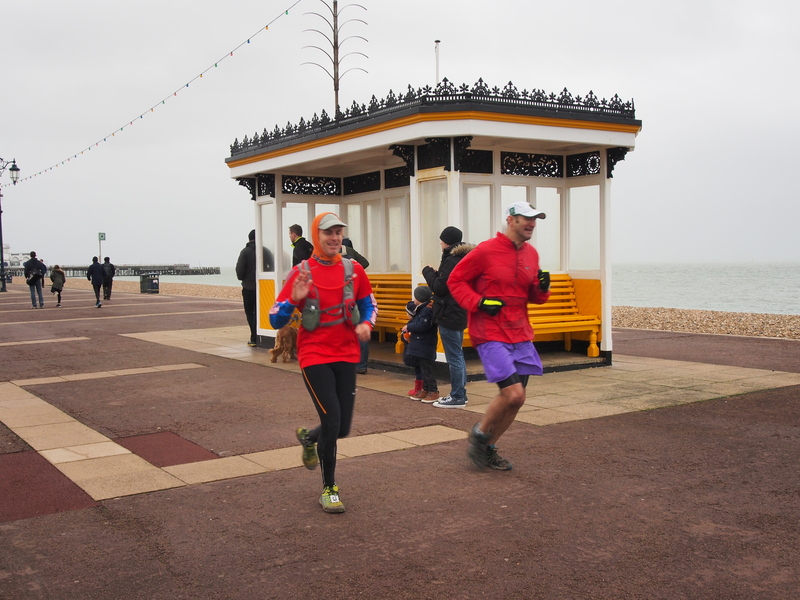 We were coming back towards a sheltered section of the course and would soon be weaving through a little bit of Portsmouth suburbia before heading back onto the esplanade and its wind. If I dug deep I could still finish inside 4hours. Those last miles were unpleasant, especially the last 3km or so into the wind along the esplanade. I ran a bit and walked a bit. People who were still running were coming past me, but I was still passing a few people who were in worse shape than me. Finally, I caught sight of Tracy as she waited just before the finish, she had to yell out to me as all I could see ahead was the finish line. My watch read 4:00:50 so I was just outside my revised time, but happy to be finished. Tracy had a dry jacket for me. I was wet through (with sweat, drizzle, light rain and sea-spray) and shivering uncontrollably. We headed straight for the car which was parked nearby. I got changed into dry clothes on the roadside and then jumped into the car, Tracy started the engine and put the heating on flat-out. We didn’t hang around for post-race festivities, heading straight back to Maidenhead, hot showers and hot soup; later beer and dinner. A personal side effect of cold for me (I don’t know if it others have a similar problem?) is that whenever I get really cold, I feel like I need to pee. Although I went before leaving the hotel and again immediately before the race, from the very start I felt like I needed to stop to “ease springs”. I did duck behind a bush at about 8km but there was no action, despite feeling like my back teeth were floating. I stopped quickly again at about 15km and again, no action. I stopped for a final time not far after the halfway turn, but again nothing! Running a marathon with an empty bladder, but constantly feeling like you need to pee is not only annoying, it’s really distracting. Although common thought is to “dress for the temperature, not the weather” this does not always work, especially when it comes to wind chill factor. Don’t always assume the locals know everything: Acclimatised locals are not always a good gauge for dress! Don’t always assume the runner in front of you can hear you when you tell them which side you’re going to pass. Although touching someone on the elbow is not done a lot around here (UK) it does work to let the other runner know you’re there and coming through. I felt pretty good the next day, with the exception of a sore toe and ankle. The toe “healed” quickly although there was very little visible sign of anything wrong. The swelling in the right ankle took a couple of days to subside; I went for a run on Xmas Day and everything seemed to be working fine.